The crystalline structure, surface morphology, electrical, and optical properties of thin films of nanocomposites consisting of silver nanoparticles embedded in poly(p-xylylene) matrix prepared by low-temperature vapor deposition polymerization were studied. Depending on the filler content, the average size of silver nanoparticles varied from 2 to 5 nm for nanocomposites with 2 and 12 vol.% of silver, correspondingly. 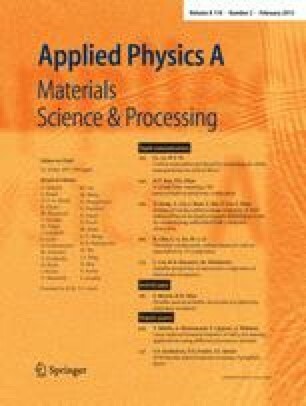 The optical adsorption in the visible region due to surface plasmon resonance also exhibited a clear correlation from silver content, revealing a red shift of the adsorption peak with the increase of the metal concentration. The temperature dependences of the dc resistance of pure p-xylylene condensate and p-xylylene–silver cocondensates during polymerization as well as temperature dependences of the formed poly(p-xylylene)–silver nanocomposites were examined. The observed variation of the temperature dependences of electrical resistance as a function of silver concentration are attributed to different conduction mechanisms and correlated with the structure of the composites. The wide-angle X-ray scattering and AFM measurements consistently show a strong effect of silver content on the nanocomposite structure. The evolution of the size of silver nanoparticles by thermal annealing was demonstrated. This work was supported by the Council of the President of the Russian Federation for support of young scientists (Grant No. MK-445.2011.3), the Russian Foundation for Basic Research (Grant No. 12-03-00679), and GK. No. 16.513.12.3020. The authors would like to thank Prof. Dmitri Ivanov and Dr. Vitaliy Shevchenko for their valuable comments and helpful discussions. Dmitry Streltsov would like to thank Bruker-Nano, Inc. for useful training and an opportunity to conduct AFM experiments on the company’s equipment.